Reading foursome, Captain and The Gypsykid started out earlier on this year, building a respectful portfolio of gigs and material. 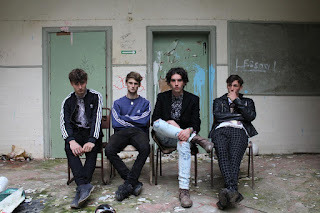 With a lack of information available, all lads are around their late teens, creating a fresh summery sound that is set to rival the majority of the alternative indie genre. Their latest EP, No Future is available to stream on Spotify and buy on iTunes. A hefty beat starts an addictive instrumental quickly met by an elated vocal harmony, mixing sounds of the likes of Two Door Cinema Club and The Kooks, also making reference to latest chart toppers, Catfish and The Bottlemen. A classic band set-up aids their wholesome body of instrumental, offering up a real indie rock hit in just under four minutes. Their sound is so refined already that it's highly plausible that we'll be seeing Captain and the Gypsykid scooping up some sweet festival slots in the Summer.